Depending on how old you are, you may remember when radiologists’ reading rooms occupied dark corners in hospital basements near the file rooms. The reading rooms themselves weren’t much more inviting than the basements, and colleagues who wanted your input on a case had to venture down into the bowels of the hospital to view films on your light boxes. But PACS and the digital world changed this paradigm. Today, “Consultations are much more likely to take place via phone, e-mail, or annotation of images radiologists share electronically” and can happen anywhere, says Eliot Siegel, MD, chief of imaging at the VA Maryland Healthcare System and a professor and the vice chair of research informatics at the University of Maryland School of Medicine. Does this paradigm shift make the reading room obsolete? No, say radiologists and the architects who design these rooms. But they agree that for today’s reading rooms to be relevant, they need to be redesigned and flexible. “It’s really critical to rethink the entire design of the room in terms of elements such as lighting, sound, and temperature,” Siegel says. Designers also have to take into account the personal preferences of the radiologists reading in these rooms. Some like to sit, while some like to stand. Some need space to collaborate and teach face to face with residents and colleagues, while others prefer partitions and private spaces to avoid distractions, says William N. Bernstein, AIA, president of Architecture for Radiology in New York. The key is to make today’s reading rooms spaces that optimize productivity while offering users the ergonomic comforts and stress-free environment they need. Woojin Kim, MD, director of the Center for Translational Imaging Informatics at the University of Pennsylvania in Philadelphia, believes it’s important that reading room design be given attention and not be an afterthought. “We radiologists are spending eight, nine, 10 hours a day in the reading room, and that environment has to be the most comfortable for us,” he says. And in today’s health care environment, where radiologists are expected to work harder for less reimbursement, they have to work more efficiently, he says, and their working environment can significantly contribute to their productivity and efficiency. About eight years ago, when Siegel was asked to design a prototype reading room of the future at the VA Maryland, he found he needed to start from scratch. Trying to adapt the film-based reading room for digital radiology didn’t work. Redesigning the entire reading room is a more effective approach than simply adding computerized workstations to one that was previously film based, he says. Starting over allows for more emphasis on the most important elements a reading room needs in a digital imaging world. For example, the film-based reading room likely had overhead fluorescent lighting, which flickers and, even when it’s not perceptible, can be a major source of eyestrain and fatigue, says Greg Patrick, president of RedRick Technologies, a reading room designer and provider of workspace solutions based in Mount Brydges, Ontario, Canada. Siegel found that indirect, incandescent lighting not only helps reduce eyestrain but also radiologists’ stress level because it’s a warmer, more natural, more calming light. Bernstein notes that many designers search for similar effects in lighting types that are more energy efficient and therefore more acceptable to health care facility managers. Patrick says low-level theater lighting works well for the pathways so that people can see their way in and out of the reading room, but the light doesn’t wash into other areas and disturb those who are reading. “There are certain types of ceiling lighting that can illuminate the pathways without being a reflection on the screen,” Patrick says. “Indirect lighting is better than direct,” Bernstein agrees. Siegel believes the most important reading room change, though, is a sound-masking system. He says soundproof walls are ideal but are potentially cost prohibitive. Using sound-absorbing materials in the carpet and tiles as well as sound baffles on the wall can have a major impact on reducing noise. Active noise cancellation technology products don’t exist for a typical radiology reading room, Patrick says. A white noise-producing sound-masking system can cost as little as $1 per square foot and helps prevent noise distractions inside and outside the room. In addition to helping to mask distracting noises, it can increase the accuracy of speech recognition systems that most radiologists today use, Siegel says. The system emits a constant sound at a frequency similar to human speech, and the sound helps to eliminate noise distractions that can come from the lobby and the MR scanners and other sounds that may be adjacent to the reading room. Partitions can provide some sound deadening but won’t “give you serious sound isolation unless they are designed and constructed to extend to the underside of the floor slab above and include acoustical insulation in the cavity of the wall,” Bernstein says. Temperature and ventilation should be another priority, Siegel says. At the VA prototype, which has five state-of-the-art reading rooms, one workstation is equipped with individual temperature controls that each user can set. Being able to adjust the room for temperature and ventilation can make the radiologists more comfortable and thus more productive, Siegel says. “As is the case when driving a car, no one wants to sit in a reading room for eight to 10 hours a day and find the air to be stale and stagnant,” he says. The heating, ventilation, and air conditioning systems need to be designed so that the radiologists have more control over their environment, Bernstein agrees. “I’ve seen a trend toward providing radiologists with more control of their environment in all aspects,” he says. Bernstein also believes the best reading rooms are those where radiologists can adjust workstation height for their practice preferences. Some need to move their monitor up and some down so they’re not straining their neck, back, or wrists, he says. Chairs also need to be adjustable so that the radiologists can sit at their ideal height. “Lighting, temperature, height of the desk, height of the chair—when we provide the radiologists with a high level of individual control over their environments, they are happier and more productive,” he says. Some radiologists prefer to stand when reading, largely for ergonomic reasons. Digital reading allows them to do this more easily than with films, which had to be hung on large light boxes that weren’t movable or adjustable like the digital workstations. “There are even commercially available monitors set up with treadmills where you walk while you read,” says Jeffrey Weinreb, MD, a professor of diagnostic radiology and the director of medical imaging at the Yale School of Medicine. A radiologist for 30-plus years, Weinreb began his career sitting to read exams and still prefers to do that today, but if he has residents who want to stand and read, he doesn’t have a problem with that, he says. “I just make it a point of getting up and walking around often so not to have ergonomic issues,” he says. Kim says even the floor materials should be part of reading room design. “They need to be of material that is easy to maintain and clean while allowing the chairs to be easily moved,” he says. The location of the reading room itself also is a trend. Some radiologists believe the best location isn’t in the imaging department but embedded in the clinical departments they serve. Brian Petersen, MD, was chief of musculoskeletal radiology for the University of Colorado School of Medicine in Aurora when a new reading room was designed. The department has four full-time musculoskeletal radiologists. For the past 6 1/2 years, these radiologists have been stationed centrally between the orthopedic, rheumatology, spine, and rehabilitation clinics. Their reading room was embedded at the point of clinical care rather than located in the hospital basement with the other radiologists. When the room was in the design phase and Petersen was asked what kind of door he wanted on the reading room, he said none. “I wanted no barriers to communication and consultation,” he says. “It is a very hectic environment, reading so near your referring physicians,” but he believes it’s for the best. When the radiologists want to discuss their findings with the referring physicians, the radiologists can easily grab the physicians or ask them to come over to the workstation. Having such a close personal relationship with the referring physicians was an unbelievable success, Petersen says. Not only do the radiologists present their findings with more immediacy, but if they have questions about the reason for a scan, they can easily go ask the referring physician, which helps them differentiate incidental findings from a diagnosis. Petersen has found that being located in the midst of the clinic gives the radiologists more credibility in terms of their opinions. It also means more referrals because the radiologists are in the faces of those with whom they’re consulting. When designing a diagnostic imaging department or clinic, as much concern needs to be given to the reading room as every other aspect, Patrick says. “It can’t be treated anymore as leftover space. The ‘we’ll put them anywhere’ attitude is long outmoded.” He says being embedded, whether fully or to some degree, fits with the recently launched ACR Imaging 3.0 campaign, which encourages radiologists to take an active role in shaping their future. Radiologists can contribute more to patient care when they’re in the center of all the activity, he says. Petersen recently moved to Spokane, Washington, to be close to extended family and joined Inland Imaging, a large private practice. Now that he’s joined a private practice, he’s struggling with how to create a similar radiologist-as-consultant atmosphere there. “We’re reading for sites remotely as well as for hospitals in and around Spokane. 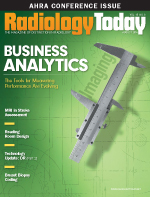 It’s a much more traditional radiology model,” he explains.